Does your council require you to submit a landscape plan with development application? Whether you are constructing a new residential property in a development or performing a major knockdown renovation of an existing property, landscape plans are essential for the successful application of your project. What is the easiest and most cost-efficient means of obtaining a landscape plan that meets all relevant criteria? How can a landscape design Sydney firm assist your application? This article will help you identify a proven technique that will help your submission to make it over the line. The requirements are different for each development company, so it pays to work with a landscape architect that has experience with a particular developer. Each council provides a landscape code that outlines the specific requirements. Most of the codes are available online in PDF format. While these codes are easily obtainable, they are complex, so it is beneficial to work with a professional landscape architect in order to ensure that your development application is successful. The Australian Institute of Landscape Designers & Managers (AILDM) highlights that “landscape designers combine technical, horticultural and design expertise to create and implement beautiful outdoor spaces”. The Institute continues to outline that landscape designers can “help you with the approval process and also help you make the best use of your outdoor spaces”. In order the maximise the functionality of your space and to expedite the approval process, engaging the services of a licensed landscape designer is the savvy option. How To Choose A Landscape Architect In Sydney? Before you sign a contract with a landscape designer, there are some simple things you can do to ensure that you choose the right person for your unique needs and budget. You should only sign a contract with a landscape designer once you have had an initial consultation with the designer. This will ensure that your project runs smoothly and that all parties are happy with the intended direction. Does The Completed Landscaping Need To Match The Landscape Plan? As most home builders submit the landscape plan up to 12 months before they actually start work on the landscaping, there can be unforeseen changes that may affect how the property owner wants the landscape to appear. The landscape does not need to identically replicate the landscape plan, it is to provide guidance in order for your plan to be compliant with all relevant legislation and council requirements. Most features of the plan cannot be changed, for example the location of pathways or the fences. It is always best to contact the development company or council before you adjust the construction of your landscaping. Make a list of your needs and want. Study the weather patterns for your property. Take note of where the sun sets and rises as well as prevailing winds. Don’t rush into the design, take time for the design to progress and evolve to best suit your requirements and outdoor lifestyle. Ensure your landscape has a focal point and theme. Don’t use trends that will date. Choosing the right landscape designer will ensure that your landscape adds value to your property and outdoor lifestyle. Julian Saw is an experienced landscape designer that has helped thousands of Sydney property owners to lodge successful development applications. 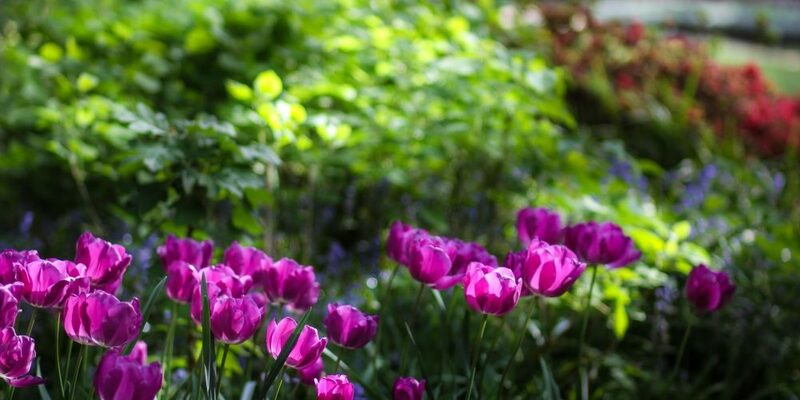 With a reputation for providing exquisite care and attention to each and every project, Dapple Landscape Design takes the stress and hassle out of designing your garden plan. 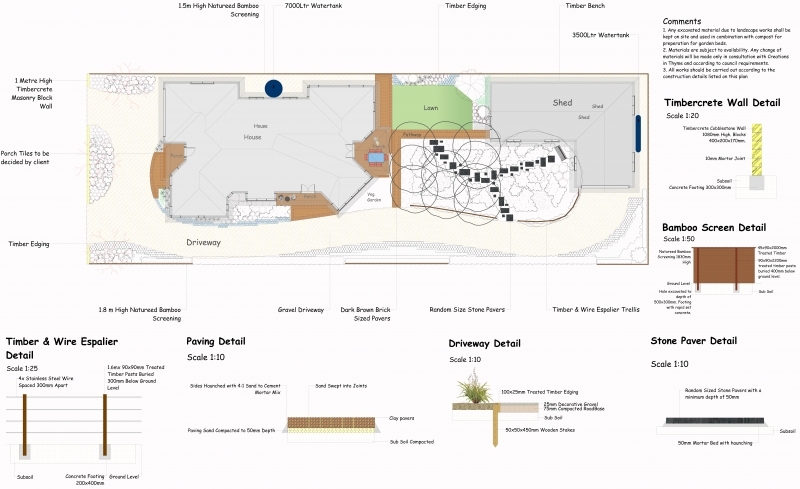 Presently, Dapple Landscape Design is offering 1:100/1:200 detailed landscape plans to suit council and developer regulations for as low as $400. If you require an affordable landscape plan that will help your project get over the line, you are going to love this cost-efficient option. Dapple Landscape Design includes a detailed plant list with a link to the specific plant details on the company website. Additionally, the plan includes landscape specifications showing details on how to install the different aspects of the garden. 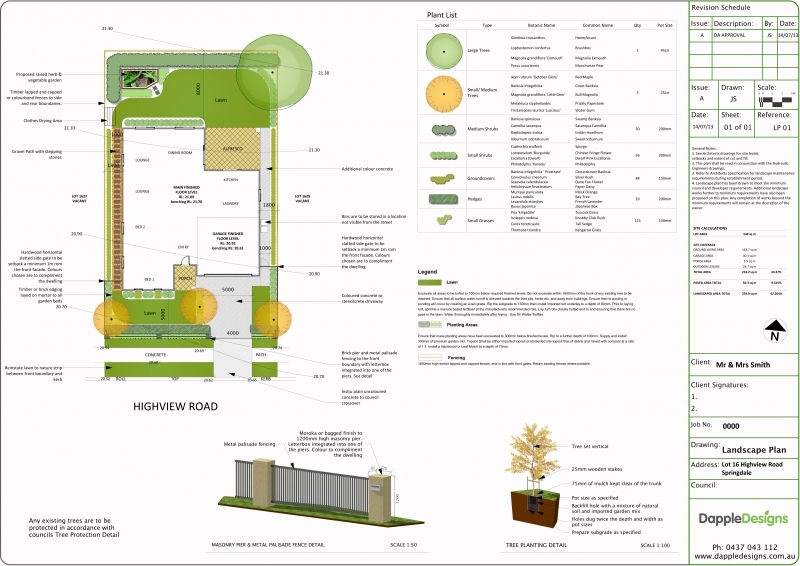 If planting and wall details are required by your council, Dapple Landscape Design will include these details on the plan. Dapple Landscape Design has worked extensively with a wide range of councils and developers in the Greater Sydney region. If you want a stylish landscape plan that is provided on time and on budget, rely on the experienced team at Dapple Landscape Design. The team provides an extensive range of services that also includes upscale landscape design packages, onsite consultations and 3D modelling packages. Dapple Landscape Design is able to tailor their designs to suit your unique requirements. Take the first step to obtaining an affordable landscape plan today and contact the team at Dapple Landscape Design.